As with many enthusiasts of suiseki, my passion for the subject began through my interest in bonsai. 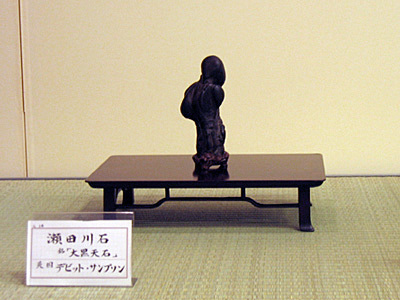 Interest in the aesthetic side of bonsai then opened my eyes to other Asian art forms. During these formative years, whilst attending UK bonsai shows and conventions, I began to notice stones being displayed with trees, which fascinated and gripped me. I yearned to find out more and bought the then only available English text book on the subject. Armed with my new found enthusiasm I became a participant field collector and began exploring parts of the UK to find stones suitable for suiseki, however, due to the geology of the UK I only had limited success. With the stones that I had managed to find I taught myself to carve daiza to display them upon. Those early days began to give me an eye for what to seek in a good suiseki. My initial encounter with Chinese Scholar Stones happened in 1991 when visiting China for the first time. Whilst touring the gardens of Suzhou I was intrigued by the many curios stones I saw displayed, their strange shapes appealed to something within me. 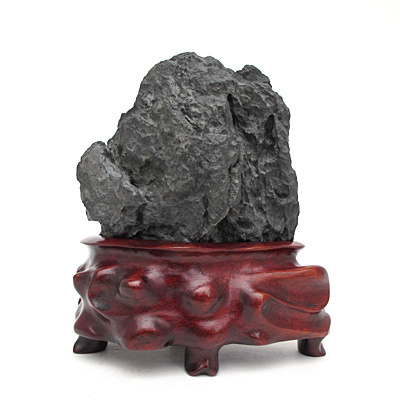 Later, when walking around the lanes of Suzhou, I came across a shop with a stone for sale in the window, here was one of the strange garden stones, but smaller and mounted on a stand, I went in, enquired about the stone and purchased it. I now regard this as the beginning of my stone collection, the stone, a Ying-shi, is of great sentimental value to me, I named it 'First Step' and it can be seen below. 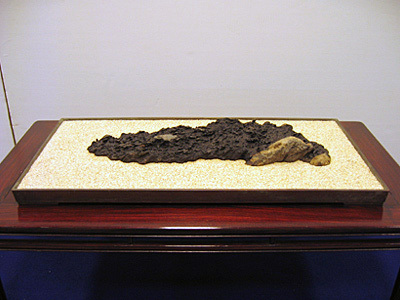 In 1994 a selling exhibition featuring many fine Chinese and Japanese stones, titled When Men and Mountains Meet, was held at a London gallery by two leading Asian antique dealers: Brian Harkins and Paul Moss. I attended the exhibition, which was my first exposure to Japanese suiseki, and seeing the beauty in these wonderful stones had a deeply profound effect on me... a eureka moment. This event was to be a major influence on the direction I took with stone collecting, and since then I have found myself favouring stones from Japan, with my approach and collection now reflecting this. Six of the suiseki from When Men and Mountains Meet now reside in my collection and Brian Harkins and I have become friends. Over the years I have exhibited a number of my suiseki at exhibitions and conventions within the UK, Europe and America, and have also attended many events as a vendor. In addition, every year since 2006 I have visited Japan to attend the Nippon Suiseki Association's annual exhibition, the Meihinten, widely regarded as the world's premier suiseki event. During these visits I have also been fortunate to see a number fine suiseki collections, being exposed to such stones and talking to their owners has helped a lot with my understanding and appreciation of the subject. I was delighted and honoured, when in both 2007 and 2010, two of my suiseki were accepted to be included in the Meihinten itself, these stones can be seen in the following two photos taken at the exhibitions. In 2001 I decided to create a website to offer stones to collectors, and was encouraged by how well it was received. With hard work and dedication it has expanded over the years, and through my contacts with Japan I am able to offer quality Japanese suiseki to discerning collectors. Since then I have supplied many suiseki and associated display items to customers throughout the world, some of whom I am privileged to say have become friends. For the past number of years I have been a regular vendor at UK bonsai events, offering items of Japanese origin - suiseki, suiban, display stands, bonsai pots, rare bonsai books and display accessories. I have also been a vendor at the following overseas events. Finally, the following line from an old Chinese folk song expresses very well my sentiment of stone appreciation. "exquisite stones can sing you songs, if you use your heart and soul to listen". Thank you kindly for your interest in my website. "12 years as a customer and over 80 suiseki later my heart still pounds with excitement when I receive a delivery from David. Offering hand selected Japanese suiseki of the most refined taste and fairest prices. He never disappoints!" "each transaction has been without issue"
"I have purchased many items from David including books, stones, suibans, and dobans. His communication is timely, his packing superb and each transaction has been without issue. We highly recommend him." "the stones from you have far surpassed the pictures of them"
"Dave, I would just like to let you know how much I have appreciated all of your help over the past few years in adding to my suiseki collection. As I have told you, I have many stones from here in the U.S. and other countries, but none of the stones can surpass the beauty and quality of the stones I have gotten from you. It was not my practice to purchase stones without seeing them personally until I got my first stones from you. And, in every instance, the stones from you have far surpassed the pictures of them that you provided. Just three months ago, I saw another of your stones on your website and thought that at the price you were offering, it might not be of the finest quality; you cannot imagine my pleasure when I received this stone and it was excellent and is a grand addition to my collection. And, most of all, I treasure the friendship that has developed between you and me. Meeting you was such a pleasure when you visited the U.S. and my husband and I were delighted with the time we spent with you. I look forward with anticipation to future stones from you. Thank you so much." "in safe hands with Dave"
"I have known Dave since 1989 when he first visited my Bonsai garden. That first meeting was prophetic, as despite all the lovely Bonsai I had for sale, Dave purchased a rock from me! Dave and I quickly became close friends, initially sharing a common love for Bonsai, and then Suiseki. We have shared many adventures and projects togethers, and during the last years I have also been a customer for Dave's Suiseki and Japanese object d'art. In all the many years I have known Dave I have never known him to be anything other than reliable, friendly, enthusiastic, knowledgable, and someone of great integrity. I can assure any potential customer of djsampson.com that they are in safe hands with Dave." "His suiseki are always of great quality and his prices are fair and realistic"
"It has been a pleasure and a privilege to know Dave. A passionate collector of suiseki, knowledgeable and a nice person. His suieski are always of great quality and his prices are fair and realistic. The service offered by Dave is fast and the stones are well packed. You can not ask for more"
"The packaging was excellent and it arrived in excellent condition"
"Your wonderful suiseki arrived yesterday. The packing was excellent and it arrived in excellent condition. We were delighted with the piece and will treasure it as our second suiseki as we start on our suiseki journey! "